The leather vest has become an integral part of the "Stereotypical Biker Ensemble." Can you name a movie you've seen recently where the bad biker character was NOT wearing a black leather vest, either underneath a classic biker jacket or alone over a T-shirt? ‘Course not. But besides buying in to the "look," leather vests are useful and sensible riding attire. A leather vest will protect your torso if you are riding without your coat. Bugs, rocks, and other road debris bounce off leather. A good leather vest has a couple of pockets in front for storing whatever you need the most. Leather vests should also be worn snug enough to offer a little support to your lower back for those long rides. Last but not least, the back of a leather vest is the perfect place to affix your favorite patches. 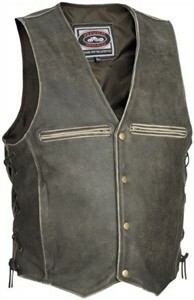 The distressed leather motorcycle vest for men by River Road is a handsome addition to your riding wardrobe. The leather is sturdy, and the distressed look is greatly preferred over shiny "Look at me I'm brand new!" leather that often comes with new items. It features side laces so you can tighten and loosen it depending on how many times you ride to Krispy Kreme. There are two chest-level pockets that zip closed for security, and those pockets are my one complaint -- anyone who designs pockets at chest level has clearly never tried to get into those pockets with one hand while sitting astride their bike, maybe even still riding it. The vest snaps shut with 4 sturdy metal snaps. Other than the unfortunate placement of the pockets, this is a nice addition.